22 Incognito Sushi Spots For The Freshest Raw Fish In L.A.
We’ve got news for real raw-fish aficionados: The legit sushi snobs in L.A. aren’t dining at scenester spots like Izakaya, or even BH's high-falutin' Urasawa. They’re feasting on sashimi at strip malls and under-wraps Japanese joints. In fact, there’s a sea of stealth sushi spots around here that boast authentic-as-it-gets chefs and boat-to-table fare; you just have to know where to look (and it ain’t Yelp, friends). That's why we cast our net wide and rounded up all of the go-to restos that insiders would only begrudgingly share. From a Bob Marley-themed place on Pico to a downtown local-loved teeny eatery, you’ll definitely want to take the bait, and nosh on our fave fresh fare. We’ll accept your "domo arigato" in advance! If you whiz by too fast on PCH, you may not even see this sweet spot shrouded in Malibu jungle. Chef Toshi serves up some of the yummiest dishes, and you may even spot a celeb or two in their sweats. We live for the Ganja and Vegas rolls, and you absolutely must try the Fried Green Tea Ice Cream for dessert (it's dashed with cinnamon, and divine). Zooma Sushi, 29350 Pacific Coast Highway (Near Zuma Beach); 310-457-4131. You know you truly love a place when it's painful to share its addy! This is definitely not scenester-sushi — so don't bother getting gussied up. Two very different worlds meet here on Pico: a rad Rastafarian theme combines cheap Japanese that's our absolute jam. So go ahead and rock out to Bob Marley tunes while you eat amazing albacore and dragon rolls with the stoney chefs. Sushi House, 12013 West Pico Boulevard (Near South Westgate Avenue); 310-479-1507. Sit at the bar at this teeny eatery for the most delish spicy tuna rolls served by the happiest chefs in town. This spot has grown more popular with the gentrification of downtown, but we promise, it's worth any wait you may face. Hama Sushi, 347 East 2nd Street (Near South San Pedro Street); 213-680-3454. Hirozen's definitely a hole in the wall, but foodies flock to the handful of tables for mouthwatering nibbles. And we strongly recommend that you do too! Hirozen Gourmet, 8385 Beverly Boulevard (Near North Orlando Avenue); 323-653-0470. This resto will have your tastebuds screaming "spectacular" from the first course down to the last mini bite. It's Omakase only, which means you're at the whim of the pros behind the raw bar, but why can't your mouth get adventurous every now and then? Sushi Zo, 9824 National Boulevard (At Castle Heights Avenue); 310-842-3977. Satisfaction is guaranteed in the flavor department at Kiriko! And they get high marks for masterful service, too. This place is all the rage with L.A.'s expert seafood eaters. Kiriko Sushi, 11301 West Olympic Boulevard (At Sawtelle Boulevard); 310-478-7769. Toshi Sushi, 359 East 1st Street (Near South Central Avenue); 213-680-4166. Hamasaku, 11043 Santa Monica Boulevard (At Camden Avenue); 310-479 7636. Crazy Fish, 9105 West Olympic Boulevard (At South Doheny Drive); 310-550-8547. 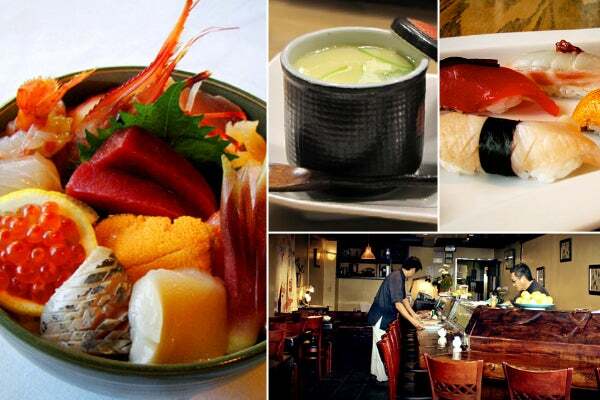 Sasabune, 12400 Wilshire Boulevard Suite 150 (Near South Carmelina Avenue); 310-820-3596. Restaurant Komasa, 351 East 2nd Street (Near South Central Avenue); 213-680-1792. Your wallet won't suffer at this Silver Lake local hotspot. Chef Saito doles out plates of sublimely innovative sushi that are still affordable — what a win-win! Saito's Sushi, 4339 West Sunset Boulevard (At Fountain Avenue); 323-663-8890. Right in WeHo, near all of the normal go-tos, this resto offers up one of the more unique experiences on this list. Fill your belly with unexpected seasonings like black truffles and pesto, thanks to Wa's ever-eclectic menu. Wa Sushi & Bistro, 1106 North La Cienega Boulevard (Near Holloway Drive); 310-854-7285. Even though it's on Sunset, Sushi Park is more unassuming than the flashy restos it sits between. It's not for the faint of heart (or wallet) though, as it's Omakase-only and comes with a hefty bill. Still, when the chef walks you through each dish as it melts in your mouth, you'll believe that the experience is 100 percent worth every penny! Sushi Park, 8539 Sunset Boulevard, Suite 20 (Near Alta Loma Road); 310-652-0523. If you're going for dinner, definitely make a ressie, as this spot is uber-popular with sea-farers! But we highly recommend you hit Sushi Gen for lunch, when you'll only have to throw down 15 bucks for rice, miso, and a sampling of sumptuous little plates. Sushi Gen, 422 East 2nd Street (Near South Alameda Street); 213-617-0552. There's a smattering of highly lauded sushi restaurants on Sawtelle, but this one will blow you away. They stick to some pretty stiff rules, but there's no need for bells and whistles here (or arse-kissing staff, for that matter) — the food truly speaks for itself. Hiko Sushi, 11275 National Boulevard (Near Sawtelle Boulevard); 310-463-7688. Sure, it's in a strip mall, but this Studio City gem has a Michelin star, so be prepared for some pricey fishies! We personally recommend the Miso Chilean Sea Bass With Daikon in a butter lettuce cup, Roasted Gingko Nuts in sea salt, and the Halibut Sashimi with black truffle. But really, pretty much every plate will send you to the moon! Asanebo, 11941 Ventura Boulevard (At Colfax Avenue); 818-760-3348. Omi, 8163 Santa Monica Boulevard (Near Crescent Heights Boulevard); 323-654-1056. Kiyokawa, 265 South Robertson Avenue (Near Gregory Way); 310-358-1900. Sushi Eyaki, 5040 Wilshire Boulevard (Near South Highland Avenue); 323-930-2636. Jinpachi, 8711 Santa Monica Boulevard (Near Huntley Drive); 310-358-9134. 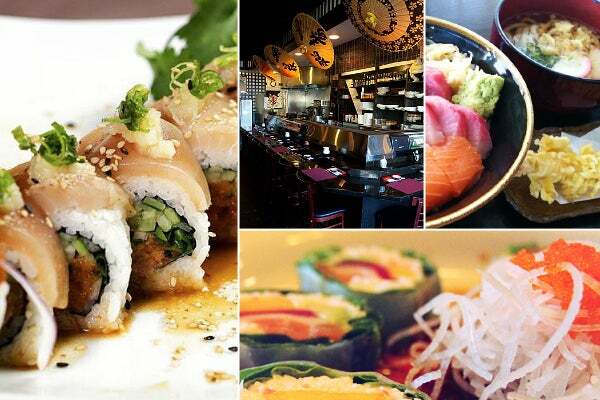 Hide Sushi 2040 Sawtelle Boulevard (Near La Grange Avenue); 310-477-7242.